Isaiah has bluntly told Judah's people and king that they were in trouble because of their unfaithfulness. Now he wants to inspire hope, so he explains how God will give them a new king, like the great king David, son of Jesse, from centuries past. The early Christian community in Rome was a mix of Jewish converts and pagan converts. Paul helps them to live in harmony, and endure persecution faithfully, by placing their situation in the context of God's eternal plan. The gospel harbors a vivid memory of one potential portrait of a coming Messiah. Though Jesus did not fulfill this expectation literally, elements of it remain in the church's hope. Our Liturgical Setting: This Sunday the Church does her last meditation, for a while, on how Jesus will come again in glory at the end of history. Today's gospel, Matthew 3:1-12, gives us the end-time vision of John the Baptist. From our vantage point, we know John got some details wrong, and that the One who came after him did not (then) bring history to its climax. But John's call for conversion still rings true. Whenever God will finally transform this world, we're sure that it will still make a difference whether one has acted faithfully or wickedly. The Historical Background: In the late eighth century B.C.E., God's people are already divided into a northern kingdom, called Israel, and southern kingdom known as Judah. Israel is already under the heel of Assyria, while Judah and its capital Jerusalem are quite shaky. As early as chapter 1 of this book, Isaiah has been criticizing Jerusalem and its king for faithlessness. In this passage, he wants to stir up hope among his people, hope that God would soon intervene dramatically to change their world and their fortunes, by the advent of a new king. To describe the king in hopeful, recognizable terms, Isaiah reaches for an image from their glorious past. Their national pride had peaked during the kingship of David, about four centuries earlier. Ever after, Israel hoped for a new David, ready to give him, when he would come, the royal title Messiah. 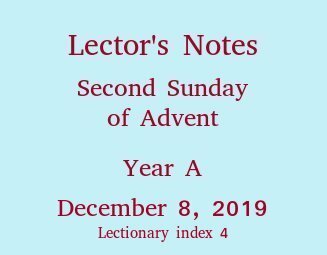 (See Lector's Notes for the recent feast of Christ the King for more detail.) Now David had been the son of Jesse. When the prophet speaks of a shoot (a branch) sprouting from the stump of Jesse, he means a new king in the family of Jesse and David. "Stump" suggests a poor remnant of a once-glorious tree, an unlikely source of promising new growth. Your Proclamation: This Messiah's first qualities are his wisdom and fairness; he'll know what's right, he'll see through the self-serving lies of the wicked, he'll make things fair for the powerless. To proclaim the first paragraph of this reading correctly, feel again the outrage you've felt about dishonest politicians, monopolistic business moguls who pollute our world with impunity, school board members who push their personal single-issue agendas, gangsters who escape conviction. 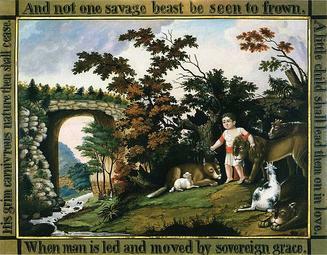 The sentence about the wolf and the lamb marks a slight break in the thought, and you should pause there. While the prior sentences were about the qualities of the coming king, the next are about the state of the world under that king's reign. Pause again before the last sentence ("On that day, the root of Jesse ..."), because the so-called root of Jesse is the new king, on whom our focus should be. but he shall judge the poor with justice, and decide aright for the land's afflicted. And so on. Feel the rhythm of this poetic structure, and let it inform your oral interpretation.